Gavin Ritchie is the first student to go through Tayside Aviation’s degree course and land a job – as a First Officer with Flybe. Dundee-born Gavin Ritchie, aged 24, will start a career as an airline pilot with Flybe on 1 November, one of the first batch of students to land a job with Tayside Aviation’s BSc (Hons) Professional Aviation Pilot Practice degree. 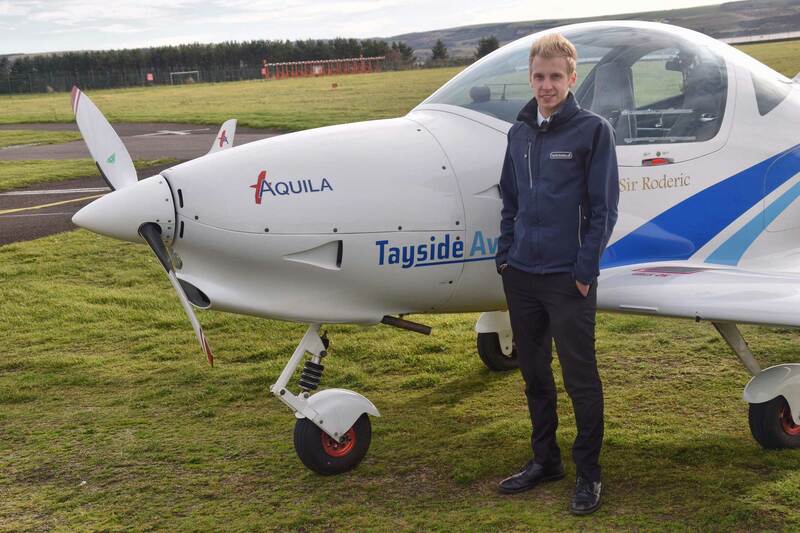 Gavin is a familiar face at Tayside Aviation, having started to learn to fly at the age of 14 at the school. He flew his first solo at 16, and passed his PPL(A) at 17. Alonside his degree, Gavin has also worked as a Flying Instructor with Tayside, logging more than 1,000 flying hours. Gavin said, “When I first heard about the degree, I felt this was the ideal route for me. It meant I could continue studying for a degree, but also undertake commercial flight training, with the end goal of landing a job with an airline. “The degree focuses on critical reflection and helps promote self-development throughout each flying stage. In a professional environment, this is very important for progressing through the flight training, but also for developing skills as a flight instructor and airline pilot in the long term. James Watt, Tayside Aviation Managing Director said, “Gavin caught our attention from the outset. With the right work ethic, aptitude and ability, we could see that he was going to be a great all-rounder with lots of potential. “He has since gone on to become a brilliant Flight Instructor and has grown in both skills and confidence. “Many people love the idea of becoming a pilot but think the costs will be prohibitive. However, our degree slashes the costs and is helping make the dream a reality for many who would otherwise not have the funds to become a pilot. Typically, gaining an ATPL licence through Tayside Aviation’s degree programme costs around £60,000. Flybe’s Chief Pilot, Stuart Mitchell added, “We are delighted to be one of the first airlines to employ one of the graduates from Tayside Aviation’s inaugural flying degree programme, and that such a clearly talented new pilot as Gavin has chosen to join us.